Browse > Home / Latest 10MC News / 2018 Global Oneness Day - coming soon! 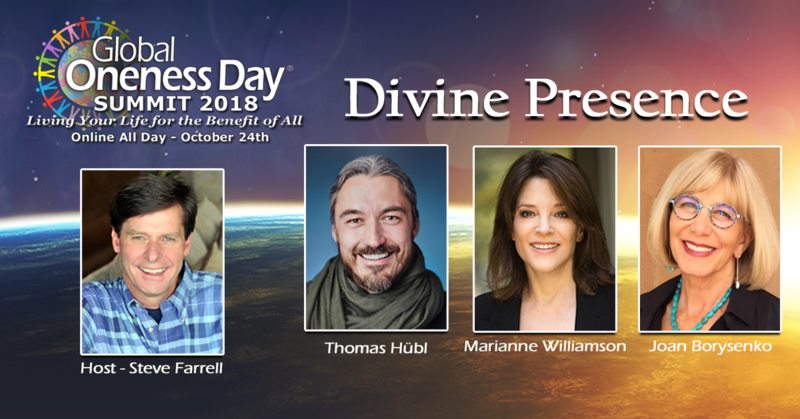 Here are just some of the luminaries for the 2017 Global Oneness Day Telesummit: Marianne Williamson, Barnet Bain, Dr. Jean Houston, Gregg Braden, Barbara Marx Hubbard, Neale Donald Walsch, Thomas Hubl, Bruce Lipton, Steve McIntosh, Gangaji, and Joan Borysenko among many others. Celebrating Global Oneness Day together is our opportunity to create a world that is life-enhancing, life-supporting and life-sustaining, but we must act quickly and in unison if we are to be successful. Just as Earth Day called attention to the environment, Global Oneness Day is drawing attention to our Oneness with Spirit, each other and all of life. Join Global Oneness Day and hear thought-provoking discussion about our common bond, our Oneness with the Divine and all of life, and visions for how we will organize in the emerging new world. Be part of the new consciousness that is transforming our planet and the way we live. We hope you will join us, and the tens of thousands of people from all over the globe for the Global Oneness Day Telesummit and help bring even more peace to this beautiful world.